While this can of course be connected to a PC it is not essential. It can just work anywhere there is a 13amp power plug. It is 21x16x14cm when closed. In use the first figure the width does not change. The last figure the height increases by 13cm when the lid is opened to form a backplane for the stored paper waiting to be printed, and this together with the front dropping down to reveal the card slots and tray for the images adds 11+12cm. So when open for use the measurements are 21x39x27cm. This is extremely easy to use the one cartridge type ink supply fits like a cassette in the base. Add some 15x10cm photo sheets at the rear in a near upright position. Plug in the power lead and switch on. Now insert a memory card it reads the number of images on it and shows one. You can then use the left or right arrow keys to find the one you want. Press print and just over 30 seconds later a dry image is presented. It is a functional cream metal box with a grey plastic lid. Open the lid and you reveal a 7x6cm TFT display that can be tilted from the back to around 80degrees to give you the perfect viewing angle to cope with light sources from almost anywhere. There are seven touch buttons all clearly marked with their function as well as the ubiquitous five position joystick button. The back left has input for the power adapter and the back right has USB for optional connection to a PC and a Pict Bridge socket however this is an intelligent socket and can also read any USB stick/pen drive. Once the output tray is lowered two card slots are revealed. The bottom one is for Compact Flash. While the top one takes SD/MMC, xD and Memory Stick it will also accept Mini SD and Memory Stick Duo with optional adapters. 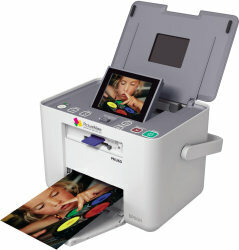 From pressing the on button it is 22seconds to being able to select a photo to print. It is termed a Photo Lab and certain basic adjustments can be made perhaps the easiest is zooming where it can be 100%, 200%, 300%, 400% or 500% but you must determine if the image is capable of this sort of zooming, moving to the portion of the image you require is straightforward. The screen is clear and easy to read and the images look great on it. I was also happy with the printed image and the just over 30 seconds to print is an always figure. The display button offers a toggle of five ways to display the image of images. One of the options from the Menu button is layout the default choice is full size borderless but there are another eight choices. Should you wish you can add your choice of twenty 'decorations' to the image. Basic editing such as red eye can be set to auto should you wish. You can also be setting a number adjust brightness, saturation and sharpness. For anyone wanting to produce 15x10cm images quickly from a memory stick or one of the cards listed this is ideal. All the normal Epson software is supplied on a CD should you also attach it to a PC but remember this is only for printing photos. The ink process used means the images are always dry when they are produced so no need to leave them to get from tacky to dry. This is not cheap but it is easy and quick to use and it gives excellent dry images. Doing my Internet searches found the Epson Picture Mate PM260 at a best price of £93.95 including delivery from the first link below. This is still quiet new so price could well drop.